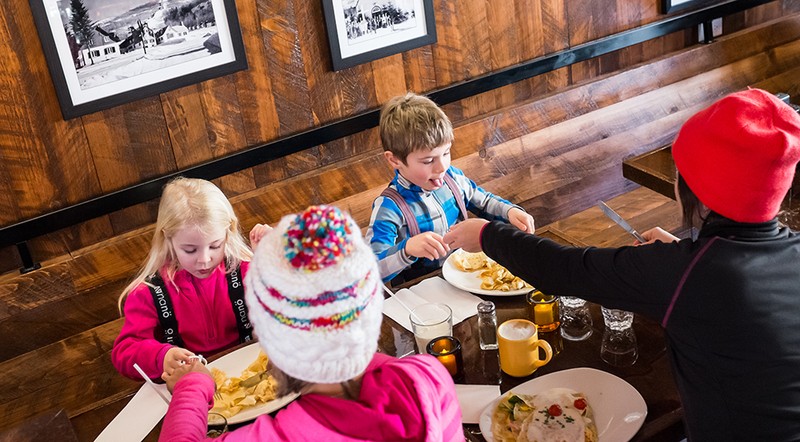 For over 20 years, Le Shack has been serving hungry skiers at the base of the slopes. With its large dining room, and terrace when it’s warm enough, families and groups of any number are welcome. On their menu, the choices reserved for kids 12 and under include: chicken fingers, pasta, sandwiches, hot-dog and dessert. The meals include one free beverage. Our village crêperie offers half-sized crêpes with simpler recipes for those smaller appetites. Options like Petite Cousine (ham and cheddar) and Chococo (chocolate-hazelnut spread) are sure to delight! The children’s meals all include either a glass of milk or juice. The La Diable brew pub has a Little Devils section to its menu featuring Minighetti and a Little Devil’s Burger. These meals, as well as the Mountain hot-dog and chicken nuggets come with fries and a beverage. For an Asian meal the whole family can enjoy, Ô WOK restaurant and lounge offers a wide array of dishes inspired by Chinese and Thai cultures. Their menu features classic Chinese food choices in kids sizes. Namely: General Tao chicken, catch of the day and fried rice with beef. Pizza. A classic! The Pizzateria serves typical Italian dishes and over twenty thin crust pizza choices. 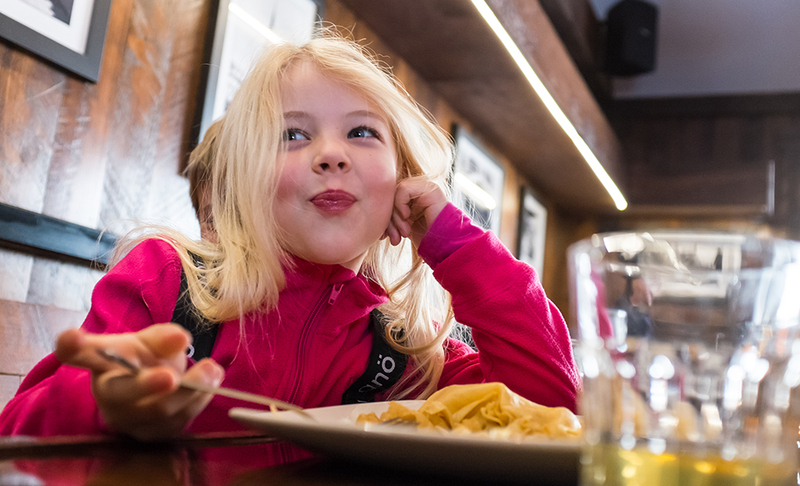 For children 12 years and under, they offer four simpler options of pizza or spaghettini, served with a soft drink or a Shirley Temple. Ya’ooo Pizza Bar is perfect for quick meal or pizza on the go. They offer four different choices of pizza slices for kids, (mozzarella, pepperoni, all dressed or vegetarian) which all include a beverage. 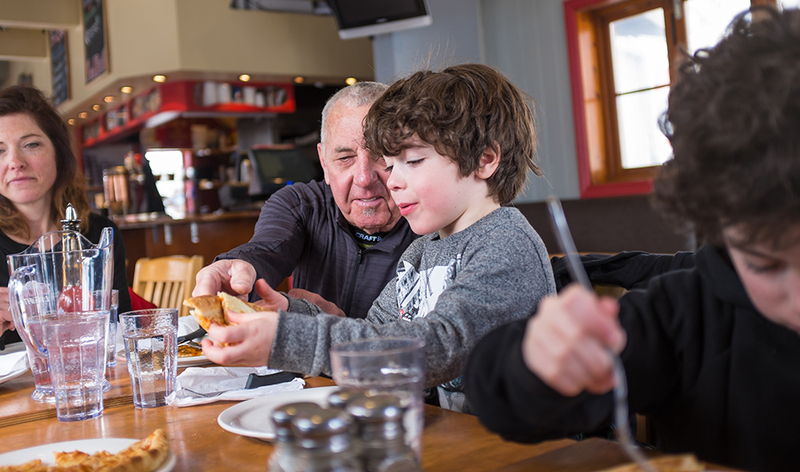 Recently opened in the Tremblant pedestrian village, St-Hubert offers an ideal family meal environment. In a wrap, in a sandwich, as a single thigh or in the form of nuggets, they serve meals that would please any kid who likes rotisserie chicken. Creative and fresh, SoCal Kitchen offers a taste of California on your plate. Their children’s menu is no exception with chicken quesadilla and grilled cheese sandwiches. Enjoy ribs, steaks, fajitas, roasted chicken and salads at Casey’s Resto-Bar. Children can choose from a good selection of smaller-sized plates even those picky eaters would appreciate. With steak, fresh fish, seafood and other grilled dishes on the menu, Bullseye Saloon and Grill also serves sandwiches and salads, ideal for a meal where every person in the family can order what they want. Nice warm sunshine for our last ski weekend! December, a festive month with events for everyone! Beach Party with Erik Guay for a DLS fundraiser!